Manamela said the company was introduced to the programme in 2009 by the Department of Economic Development, Environment and Tourism and has improved in terms of staff morale, number of employees, turnover, productivity and competitiveness. In 2009, the company had 31 employees, but the number has since increased to 99 employees. According to Motlatsi Gabaocwe, Workplace Challenge Programme Executive Manager, the programme is a two-year journey implemented among South African companies operating in the manufacturing sector to improve their productivity and competitiveness with the aim of ensuring the sustainability of jobs. Productive SA Chief Executive Officer Mothunye Mothiba indicated that the programme was initiated by the dti and is managed by Productivity SA. He went on to say over the past three financial years more than 1 400 companies ranging from small to large corporates participated and over 143 429 jobs were sustained. “With this programme, we have seen improved turnovers, improved staff morale, cost of goods going down and companies becoming productive and competitive. Management and workers are now talking to each other on productive issues. We plan to increase the number of companies enrolling in the programme from 100 to more than 200 per annum. Once we have more companies enrolling in the programme, we will see an economy that will generate more income, create more jobs and alleviate poverty,” Mothiba said. The celebration started with a tour to PCS’s factory at 45 Emerald Street followed by an official programme at the company’s recently built factory located at 15 Tin Street where various speakers alluded to the importance of the programme. 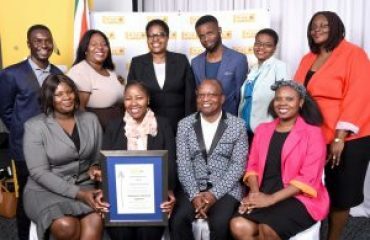 The ceremony was guided by the theme ‘Ensuring sustainability for South African enterprises’ and attracted officials such as the Deputy Director-General of Special Economic Zones (SEZ) and Economic Transformation at the dti, Sipho Zikode. He said “The programme is a productivity and competitiveness enhancement intervention at Small, Micro and Medium Enterprises in the manufacturing sector, with this programme we want to reduce inefficiencies in production which may adversely affect the growth and development of SMMEs. We want to reduce production costs, enhance quality, reduce wastage, improve safety in the work environment, and create more jobs.” He added that it is imperative to invest in productivity improvement for the competitiveness of small businesses.